If you asked someone what a smart display was two years ago, they’d probably have looked at you blankly. But now, smart displays – essentially smart speakers that use screens to supplement the user experience – are fast becoming all the rage. 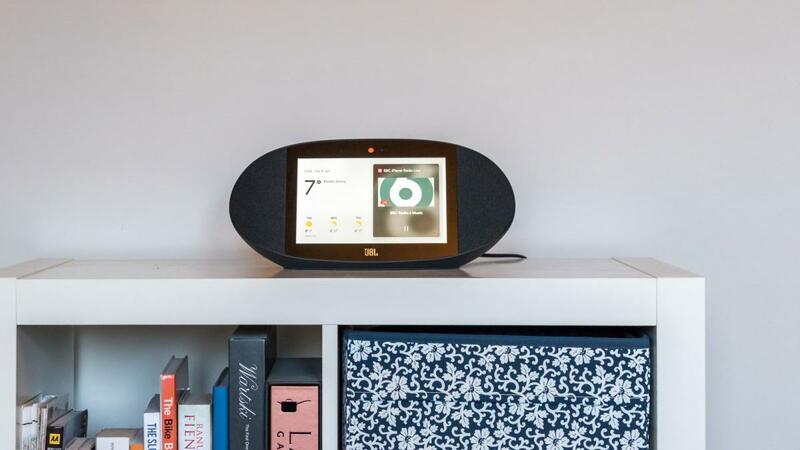 Following on from the Google Home Hub and Lenovo Smart Display, the JBL Link View is the latest Google Assistance-powered smart speaker to hit the shelves. But how does it compare to its rivals, and which one should you buy? Because it’s powered by Google Assistant, there’s no difference between the setup and core features of the JBL Link View and its aforementioned rivals. You can use it to play music and YouTube videos, show cooking instructions and importantly control all your smart devices – lights, thermostats, cameras, media devices and so on – from one place. You can also use the Home Hub to make free audio calls to mobiles and landlines. 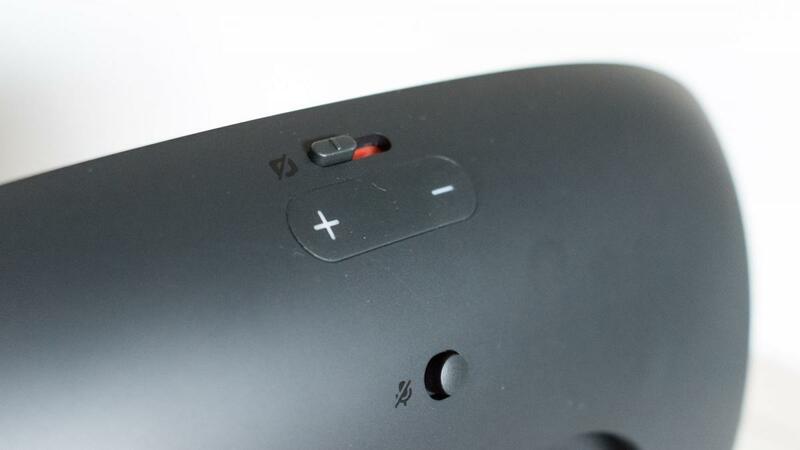 The one exception is that, like the Lenovo Smart Display, the JBL Link view has a front-facing camera and so supports proper two-way video calling via Google’s Duo app. Otherwise, all the differences are physical. The JBL Link View has an 8in screen, which is the same size as the smaller Lenovo Smart Display and a smidge larger than Google’s 7in screen. As you’d expect, being a speaker specialist, JBL has also focused much of its attention on making the Link View sound great, and it delivers on that in spades (I’ll cover this in more detail later). Unlike its rivals, the JBL Link View is also IPX4 water-resistant, which means it’s protected from water splashing on it from any angle. 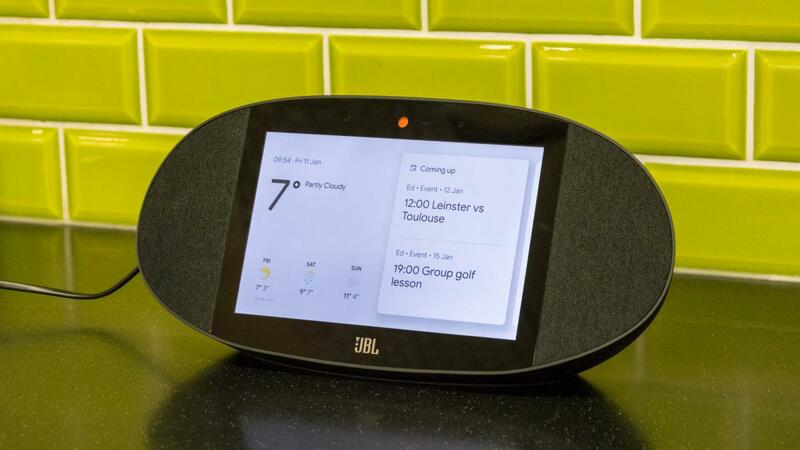 The JBL Link View is the most expensive of the current crop of Google Assistant smart displays with a recommended retail price of £250. In comparison, Google’s Home Hub sells for £140, while Lenovo’s Smart Display costs £180 and £230 in 8in and 10in sizes, respectively. If you’re not already invested in Google’s ecosystem, the only other option is the 2nd-gen Amazon Echo Show, which is powered by the company’s Alexa voice assistant. The Echo Show has a 10in display and costs £220. Despite having an 8in display, the JBL Link View is much closer in size to the 10in Lenovo Smart Display than the diminutive 7in Google Home Hub. At 100mm deep, it’s still small enough that you might just about squeeze it on a large bedside table; there won’t be room for much else, mind. Unlike its rivals, the display is flanked by two 51mm drivers. Otherwise, everything is pretty standard fare for a smart display. On the front, there’s a 5-megapixel camera above the screen that you can disable via a mechanical switch on the rear, along with two far-field microphones and an ambient light sensor that enables automatic screen brightness. Reach behind the speaker and, beyond the camera switch, you’ll find a volume rocker and a mute switch for the microphone. The only other noteworthy design feature is a passive radiator on the speaker’s reverse that helps to boost bass response. As for the display, it’s an 8in “HD” panel. That nomenclature typically implies a resolution of 1,280 x 720. That’s more than enough for a screen of this size, especially when viewed from afar but, disappointingly, the screen is somewhat let down by poor viewing angles. To elaborate, images look great with accurate colours when viewed from head-on at standing height but when you look from across the room at more of an angle they take on a slightly blue sheen. That’s quite disappointing when the screen on the cheaper Lenovo Smart Display is so good. Otherwise, there’s nothing especially remarkable about the JBL Link View. It certainly won’t win any design awards, but nor is it offensive. One thing I did notice is that, thanks to its black casing, dust shows up more clearly than on its competitors from Google and Lenovo. JBL Link View review: What does it do? As I’ve already explained, the JBL Link View works almost identically to its Google-Assistant smart screen rivals. That means after you’ve set it up via the Google Home app for Android or iPhone, it shows the same simple interface comprising weather info, calendar events, “Top stories for you” and recommendations from Spotify and YouTube. As with any Google Assistant-powered smart speaker you can then ask the speaker whatever you please and wait with bated breath to see if it delivers a useful answer. Search for recipes, ask for directions, set countdown timers – you name it, it can do it. The only difference is, having a display, the JBL Link View delivers on-screen visuals to supplement the experience wherever possible. That’s great when you want to check a countdown timer at a glance or see a currency conversion and when you’re playing music from Spotify or BBC iPlayer Radio, the screen not only tells you what you’re listening to, but also provides handy on-screen controls. The other main advantage of having the display is that you can control your lights, thermostat, cameras, media and other smart devices by opening the Home View by simply swiping down from the top of the screen. Since it’s powered by Google Assistant, JBL’s smart speaker works with most popular smart home brands including Philips Hue, Nest, Hive, Ikea Tradfri and TP-Link. When it’s not in use, the Link View can also be configured to show images from your Google Photos account. From the Google Home mobile app you can choose the albums that appear or, if you prefer, there’s also a “Recent highlights” option that attempts to automatically select your best snaps. If you want to make the most of Google Photos’ AI while having a little more control over it, it’s also possible to have it show family and friends you’ve tagged in the Google Photos smartphone app. Unfortunately, like its rivals, video streaming on JBL’s smart display is limited to YouTube, at least as far as initiating playback via a voice command is concerned. However, if you have your smartphone handy, it supports casting from a number of popular apps including Now TV, BBC iPlayer, ITV Hub, All 4, and BT Sport. Netflix, alas, is not supported, which is disappointing. As for sound quality, I’ll cut straight to the chase: the JBL Link View is, to my ears, the best-sounding smart display you can currently buy. It’s not quite perfect. On some tracks when you’re facing the speaker head-on there can be a harshness in the treble frequencies but, by and large, it delivers a fun, controlled sound with plenty of bass and heaps of detail. It’s the only Google-Assistant powered smart display I’d be happy to recommend as a primary listening device. Indeed, it delivers enough oomph to comfortably fill an average-sized kitchen or living room, where its competitors struggle at higher volumes. Having speakers either side of the display means you also benefit from stereo audio, something that’s absent from the Google and Lenovo devices. Whether it’s worth £250, then, comes entirely down to how much you’re prepared to spend for the luxury of superb sound quality. Since smart displays are speaker first and display second – you’ll spend more time listening to it than looking at it – I’d have no hesitation in recommending the JBL Link View. Is it worth paying an extra £110 over the Google Home Hub? Absolutely. Without diminishing Google’s excellent product, you’re getting a larger screen, two-way video calling and sound quality that’s frankly in a different league. If you want the very best Google Assistant smart display, there’s no doubt this is it.